Research shows that 300 suicides in England each year involve a person with a terminal illness. The law is forcing dying people to risk a painful and gruesome death. Without an assisted dying law people are taking their life behind closed doors can make a dying person’s situation worse. But they are unable to have an open conversation with their doctor or families. To discuss this with anyone could implicate them in a crime with a possible prison sentence of 14 years. Every eight days someone from the UK travels to Switzerland for help to die. Ten times as many dying people are ending their lives at home. 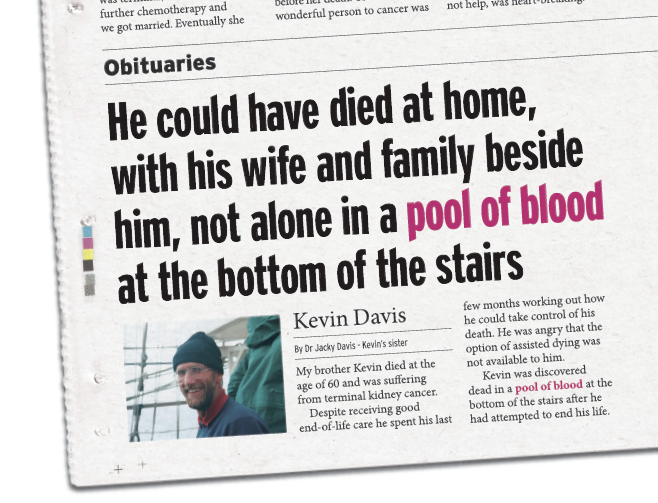 The law is cruel and until it changes, stories like Kevin Davis (below) will continue to be a grim reality. If you are willing to share your experience please let us know using the form below.